Environment: Flash Builder 4.6, Flash Professional CS6, AIR 15, OSX 10.9.3. 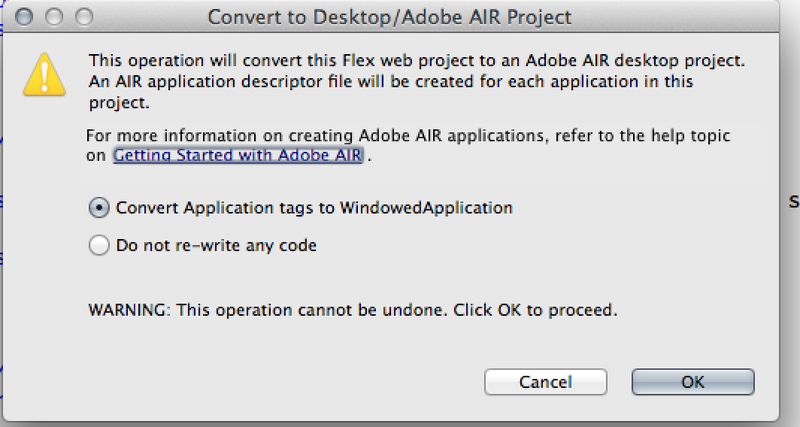 AIR 15 is installed for both Flash Builder and Flash Professional. 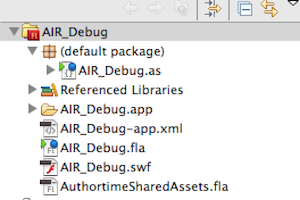 I am trying to get Flash Builder 4.6 to run/debug an .fla/AIR desktop project. I am able to edit code in Flash Builder and run the project in Flash Pro but I would like to use Flash Builder exclusively, aside from .fla tasks. The only build configuration Flash Builder uses for FLash Pro project is web application and it will not let me create a valid desktop configuration. See screenshot below. I am baffled – and have been at this for hours. Does anyone know the secret handshake? Cmd/Control-click on the project name in the sidebar to display the context menu and select "Add/Change Project Type" and select "Convert..." etc. Not the answer you're looking for? Browse other questions tagged flash air flash-builder or ask your own question. 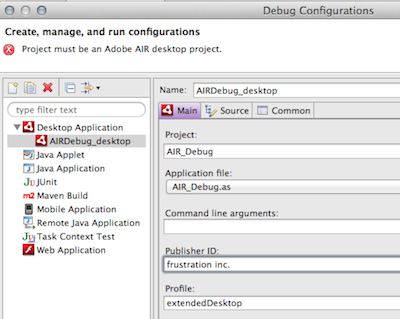 “Project must be an Adobe AIR desktop project”?